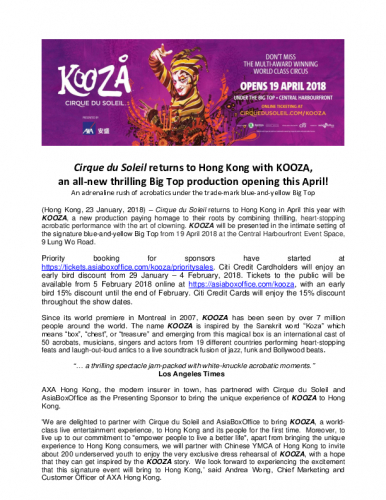 Press Release: Cirque du Soleil returns to Hong Kong with KOOZA, an all-new thrilling Big Top production opening this April! an all-new thrilling Big Top production opening this April! (Hong Kong, 23 January, 2018)– Cirque du Soleil returns to Hong Kong in April this year with KOOZA, a new production paying homage to their roots by combining thrilling, heart-stopping acrobatic performance with the art of clowning. KOOZA will be presented in the intimate setting of the signature blue-and-yellow Big Top from 19 April 2018 at the Central Harbourfront Event Space, 9 Lung Wo Road. Priority booking for sponsors have started at https://tickets.asiaboxoffice.com/kooza/prioritysales. Citi Credit Cardholders will enjoy an early bird discount from 29 January – 4 February, 2018. Tickets to the public will be available from 5 February 2018 online at https://asiaboxoffice.com/kooza, with an early bird 15% discount until the end of February. Citi Credit Cards will enjoy the 15% discount throughout the show dates. Since its world premiere in Montreal in 2007, KOOZA has been seen by over 7 million people around the world. The name KOOZA is inspired by the Sanskrit word “Koza” which means “box”, “chest”, or “treasure” and emerging from this magical box is an international cast of 50 acrobats, musicians, singers and actors from 19 different countries performing heart-stopping feats and laugh-out-loud antics to a live soundtrack fusion of jazz, funk and Bollywood beats. AXA Hong Kong, the modern insurer in town, has partnered with Cirque du Soleil and AsiaBoxOffice as the Presenting Sponsor to bring the unique experience of KOOZA to Hong Kong. 'We are delighted to partner with Cirque du Soleil and AsiaBoxOffice to bring KOOZA, a world-class live entertainment experience, to Hong Kong and its people for the first time. Moreover, to live up to our commitment to "empower people to live a better life", apart from bringing the unique experience to Hong Kong consumers, we will partner with Chinese YMCA of Hong Kong to invite about 200 underserved youth to enjoy the very exclusive dress rehearsal of KOOZA, with a hope that they can get inspired by the KOOZA story. We look forward to experiencing the excitement that this signature event will bring to Hong Kong,’ said Andrea Wong, Chief Marketing and Customer Officer of AXA Hong Kong. KOOZA is currently delighting audiences in Beijing, China where the season will wrap up on 11 February 2018 and then move to Shenzhen where it will play until 1 April 2018. The tons of equipment and over 1000 costume pieces will then make their way to Hong Kong. * Public holiday shows on May 1 & May 22 are at 5p.m. Corporate and Group Bookings are available via Asia Box Office. The ultimate Cirque du Soleil experience with the best seats and access to the intimate VIP suite one hour before the show and at intermission, including delectable wines and hors d’oeuvres and take home souvenirs. Cirque du Soleil gratefully acknowledges AXA Hong Kong as the Presenting Sponsor, Skoda and Kerry Hotel Hong Kong as Official Sponsors and Citi as the Official Credit Card Partner of the KOOZA Hong Kong tour. From a group of 20 street performers at its beginnings in 1984, Cirque du Soleil is a major Québec-based organization providing high-quality artistic entertainment. The company has close to 4,000 employees, including 1,300 artists from more than 60 different countries. Cirque du Soleil has brought wonder and delight to more than 180 million spectators in more than 450 cities in over sixty countries on six continents. AsiaBoxOffice (ABO) is the ticketing and promoting partner of the highly anticipated Cirque du Soleil show, Kooza, in Hong Kong. It operates AsiaBoxOffice.com, an Asian based e-commerce ticketing solutions platform, focusing on the rapidly growing segment of entertainment, sports and lifestyle events in Southeast Asia and Greater China.